Would you believe that there are thousands of seniors who die every year due to suicide? Do you know that a majority of these seniors committed suicide because of depression? Studies have shown that this age group, sixty-five years old and above, are the most depressed age group among all others. Experts have recorded that this plague among the elderly is due to various issues which occur during seniority including: poverty, physical changes, and loss of friends and relatives. Nevertheless, Bayou Home Care opines that it is incumbent upon us- the relatives and family of the elderly- to make their days lighter. Usually, seniors live alone- their spouses have passed away and their children have been living with their own families. So it is not surprising to know that they will not have anyone to talk to in a day. Some elders would just choose to spend their day at home doing chores, watching television or tending to their garden. Despite these few daily activities, they could still become lonesome. It will make a difference if they will be able to talk to someone else once in a while or at least once every week. And who do you expect to do this for them? It should be you. Your parents surely miss the times when their partner used to bring them on a special date at a cozy and fancy restaurant. Dining out with a special person would indeed be one of the best memories they’ve had. Since nobody will be doing that for them anymore, now is your chance to do that for them. It won’t be burdensome to treat them at their favorite diner once in a month, will it be? Isolation causes depression. If a person has not mingled with others for a long period of time, the feeling of sadness stocks up until the time when they would already want to end their lives. You should not let this tragic ending happen to your parents. You can make a big change in their social and emotional well-being by simple inviting them over at your house to bond with your family. Yes, death is certain; so as long as your loved ones are still alive, you have to help them make their lives more meaningful. And providers of home care in Louisiana knows how you can do this: be the reason of their happiness. 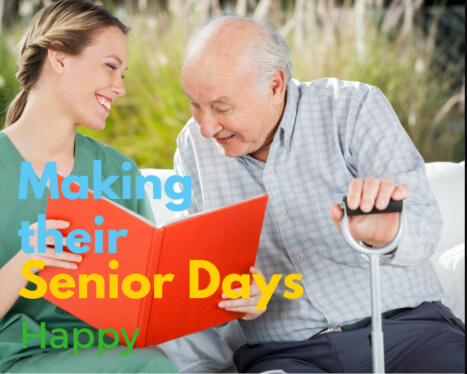 This entry was posted in Home Health Care and tagged elder care, Make Senior Happy, Senior Days Happy. Bookmark the permalink.